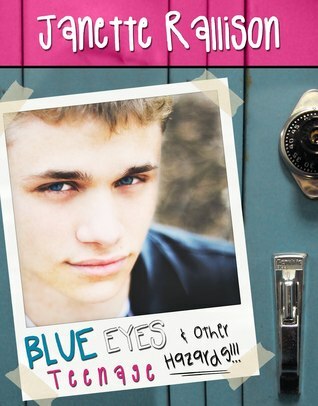 Title: Blue Eyes and Other Teenage Hazards!!! Janette Rallison wrote Deep Blue Eyes and Other Lies sixteen years ago, and she got the rights back to it a few years back. Deep Blue Eyes and Other Lies was written with characters that were members of The Church of Jesus Christ of Latter-day Saints, also known as Mormons. The book was one of my favorites as a teenager, but it was written for a Christian audience. She rewrote some parts, changed some names, and added some modern stuff like cell phones, and now it’s for any audience. I loved this book all over again! Janette Rallison cannot go wrong in my mind. Her books are always enjoyable and so funny with cute romances. It was fun to read a familiar book with some new twists. The characters are funny and easy to relate to. One of my favorite scenes was when Cassidy took her driver’s test, hilarious! The old man that administered her test reminded me of a guy I had to drive with during driver’s ed. He was totally paranoid. He would grab the steering wheel from me and slam on his brake all the time. I promise I’m not a bad driver; the poor man was just terrified. I love her books. I hadn't heard of this one.